A type of food wrap made from various ingredients that are mixed together to become a fresh dough used to make the skins. 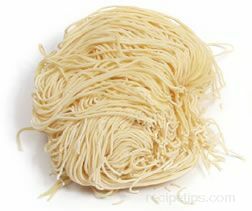 The dough, which in most instances is basically an uncooked, wide noodle pasta, is rolled out, flattened and cut into small individual squares, rectangles or circular-shaped sheets to become food wraps or soup ingredients. Also known as Wonton Wrappers, the skins are used for making Chinese dumplings often referred to simply as "Wontons", as well as pot stickers, eggrolls, and soup noodles. Available in Asian markets and other food markets, Wonton Skins used as a wrap securely hold a mixture of ingredients made as a filling placed within the center of the skin which is then sealed, rolled or folded around the filling and cooked. 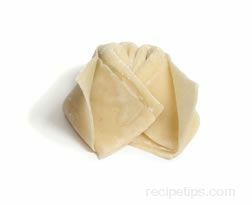 When filling Wonton Skins, round skins will most often hold the largest amount of filling while the square or rectangular skins hold less. Be aware that excess air that is not removed from filled and sealed Wontons, may cause the wrap to puff up and expand more than necessary. To keep the wrapper tightly enclosed around the filling, press out excess air prior to sealing the edges of the wrap. Unstuffed Wonton Skins can be stored in a refrigerator for approximately 1 week or for several months in a freezer. Stuffed skins can also be frozen, but if they are to be fried for prepartion it is not advisable to freeze them. 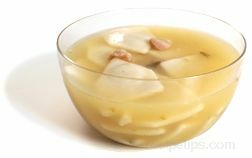 However, stuffed skins that are frozen can be prepared by boiling without thawing and without damaging the skin or contents. Other names for Wonton Skins or Wrappers include: wanton, wun tun, wahn tan, huntun, shao mai, and siu mai.